Sorry all for being MIA. 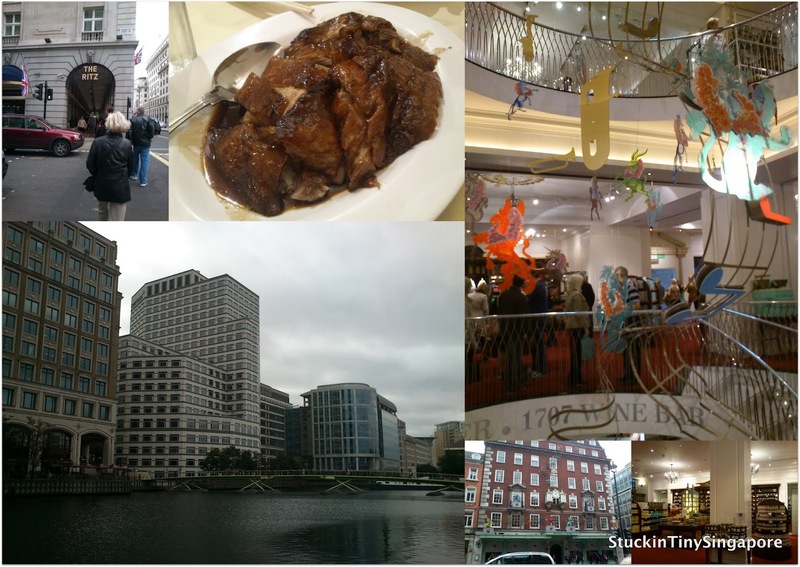 Was in UK for over 3 weeks. It has been 2 years since my last visit and it was great to be back. 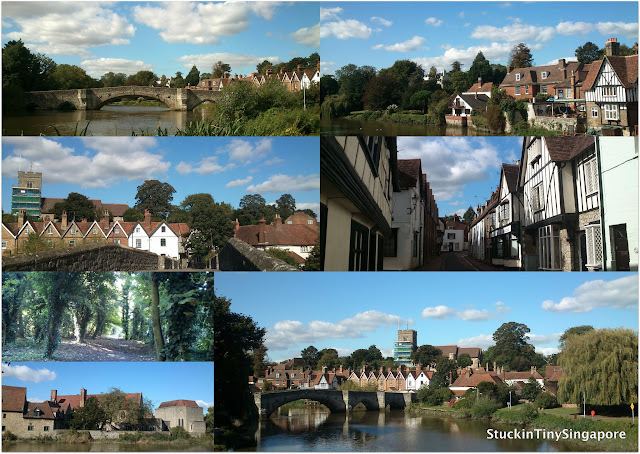 Another friend of mine was in UK at the same time, and we had a great time checking out old hangouts and discovering new places too. We were also lucky with the weather. It was in the teens and lovely sunshine, the perfect weather for walking around. 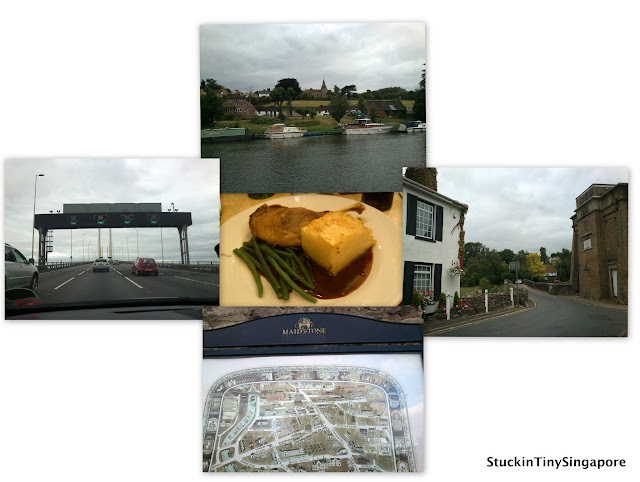 I also got to drive a lot, from London out to Essex, Suffolk, Hertfordshire, Kent & Surrey and it was great. After driving over 1000 miles in a manual car, I didn't grumble at all. It was therapeutic to drive in the UK as almost everyone is a polite driver. Now that I'm back in Singapore, I am missing that very much. Lots of stuff have been happening since I'm back. The hubby and I are rushing off on our New Zealand South Island trip for 10 days. The shortest planning time I ever had for a holiday - 2 weeks! Followed by arranging to go to Kuala Lumpur for a short weekend to meet up with some friends in november. The hubby also will be popping back into London for another business trip and it is very tempting to follow along. Sun was shining when we arrived in Heathrow. I had to snap this picture as we drove past Buckingham Palace in our cab. The sun was shining and London could not look more beautiful!!! The next day after I arrived, I met with my friend and off we went for a day of fun!!! We went to check out the British Museum. It was good to be back. We spent a few hours there and went for lunch. Found a quaint little french restaurant that offered a great lunch deal. My friend ordered this yummy pork belly dish. The pork was done amazingly, it was crunchy outside and soft on the inside. After the heavy lunch (plus desserts), we had to walk it off. We went from Holborn all the way to Covent Garden to Leicester Square where we checked out the the humongous M&M shop! It has 4 stories of everything M&M!! 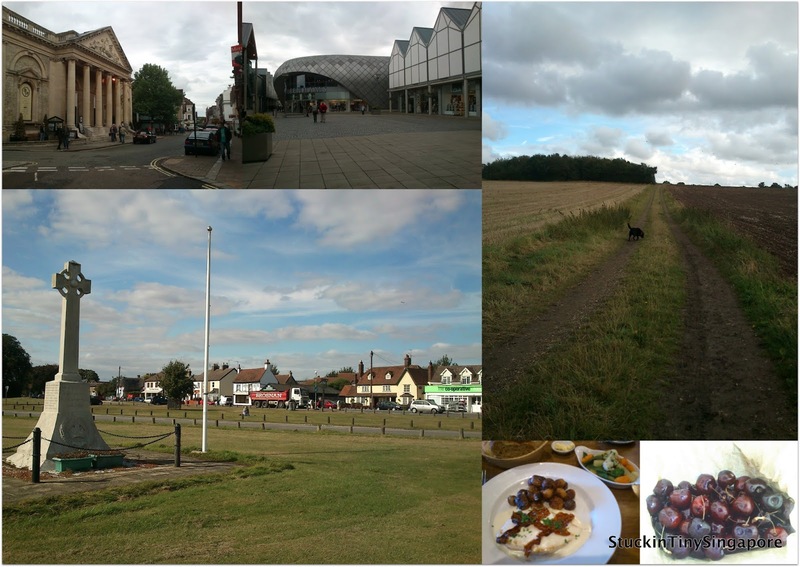 The 2nd weekend, the hubby and I popped back into Kent. This time we explored further. We went to a village which had the most beautiful postcard view ever. A lovely bridge over the river Medway, with willows swaying in the background. We had a lovely pub lounge overlooking the river and went off on the public footpaths for a lovely saturday afternoon walk. Life's just dandy!!! The last weekend in London, we decided to spend some time exploring her. 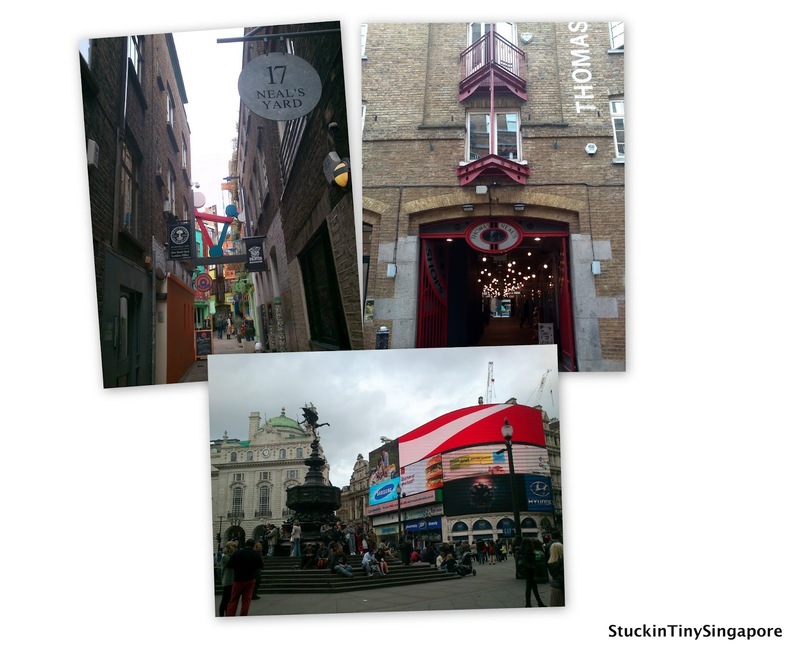 We went off back to Covent Garden and discovered an area that was new to me. I had always gone straight into Covent Garden but this time we turned left into an area known as Neal's Yard. It looked really bohemian. There were cutesy boutiques, and one of a kind shops. Even the cafes and restaurants in the yard looks really funky. A note to check it out the shops proper with a girlfriend. Hubby is not a shopper at all so I didn't want to bore him that afternoon. For Lunch, we had it planned to go for the Four Seasons Roast Duck as mentioned in my other London posts. It is the most amazing, yummylicious duck ever. Even my fussy tongue hubby loves the duck, so we went there just before the lunch crowd to grab seats to enjoy our lunch. It is still as good as I remembered. 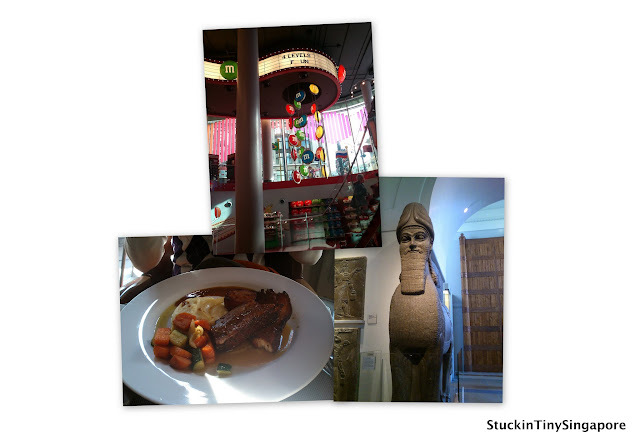 After that, we went off to Piccadilly and walked to Fortnum & Masons to pick up some goodies to bring back as gifts. I spent a good while wandering around all the selections to pick up what I wanted. Finally we were back in Canary Wharf. It has a different feel to the rest of London. It reminds me of Singapore with all the tall gleaming offices, and clean streets. Three weeks came and went so quickly. Before we knew it, it was the day to fly back to Singapore. 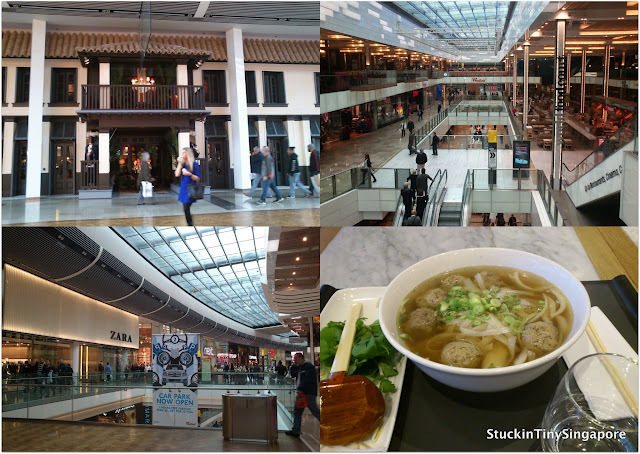 As we had some time to kill before getting the cab to the airport, we went to check out the big new Westfield mall at Stratford. It was huge and had all the known high street names in there. They even have a nice selection of restaurants and an ultra cool food court. I settled for a meatball pho as it's been a while since I had any nice soup noodles. What a great way to end my trip back to London. Will be back soon!!! !